It’s good to finally reach closure on this issue, and for the City of Clayton to prevail in its efforts to protect the public health and welfare, both indoors, as well as outdoors in city-controlled parks. Legal challenges to indoor smoking bans have failed. But prohibitions on smoking in outdoor areas are churning in the courts. Which brings us to Clayton, Mo., a city that borders St. Louis. Arthur Gallagher, an avid outdoor smoker, sued Clayton in 2011, claiming a ban on smoking in city parks it had enacted a year earlier was unconstitutional. (Several other cities, including New York, have similar bans.) He asked the federal courts to recognize smoking as a fundamental right and argued that any law restricting tobacco use deserves the utmost scrutiny from judges. On Thursday, the St. Louis-based U.S. Court of Appeals for the Eighth Circuit declined to recognize a right to smoke and held that Clayton had a rational basis to restrict smoking in parks — namely, to preserve and protect the health, safety and welfare of the public. Mr. Gallagher had argued that the ordinance unfairly targeted smokers but failed to address other sources of air pollution, such as smoke from barbeques or exhaust from nearby vehicles. He also argued that no member of the public could be harmed by secondhand smoke outdoors, because it dissipates in the air. Clayton relied on a number of studies in enacting the law, including a report of the U.S. 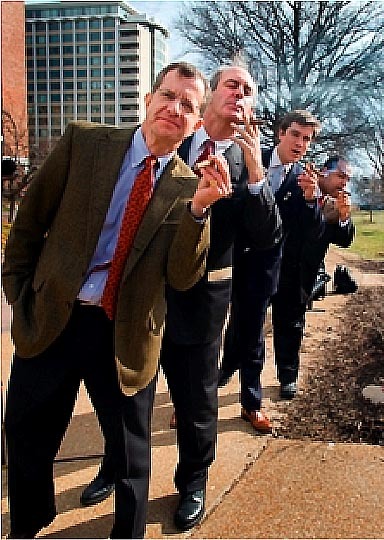 Surgeon General indicating “there is no risk-free level of exposure to secondhand smoke,” the Eighth Circuit noted, in an opinion by Chief Judge William Riley. “We need not determine whether outdoor secondhand smoke exposure actually causes harm. Because the City reasonably could believe this to be true, the Ordinance survives,” Judge Riley wrote. Bevis Schock, who represents Mr. Gallagher, disputed whether the city could have reasonably believed that secondhand smoke outdoors causes harm, given the dearth of research on the subject. The Eighth Circuit ruling affirmed an earlier decision by U.S. District Judge Charles A. Shaw in St. Louis. Smoking a fundamental right? Don’t think so. Tobacco smoke poisons the air others need to breathe, even if outside.The moment tobacco fumes from a nearby smoker enter your lungs willy-nilly you got chemical poisons on their way to your blood. Endangering the health of others is not a fundamental right. Horacio, when you BREATHE you are poisoning the air that I need to breathe, even if outside. Your respiratory excretions are just as repugnant and poison-filled as your urinary, defecatory, and perspiratory excretions. The moment your exhaled metabolic waste products enter my lungs willy-nilly I’ve got chemical poisons (as well as all manner of uncounted and unknown potentially lethal pathogens) on the way to my blood. Endangering my health is not a fundamental right. Of course if I worried about such stuff and actually spent energy trying to avoid being closer than 20 feet to people because I was worrying about their secondhand breath I’d be a crazy person. Stephanie Stahl offers some helpful guidelines for recovery. mogasp comment: I’ve never heard of secondhand breath being an issue for human beings.